Nicholas Mathisen’s unused graduation cap and gown were destroyed when heat and smoke scorched his home in March. His family was renting the upper unit of a converted garage on South Shore Drive by Delavan Lake. The lower unit caught fire, and oily, greasy soot coated the family’s belongings. Nicholas’ family lives paycheck to paycheck. They didn’t have renter’s insurance or savings, and they had to scramble to find a home. It’s the second time Nicholas has been homeless in about five years. Nicholas, 18, is expected to graduate from Delavan-Darien High School in June. He is one of 61 homeless students in the Delavan-Darien School District, where homeless enrollment has skyrocketed in the past seven years. Between the 2011-12 and the 2015-16 school years, homeless enrollment in the district swelled more than 764% (14 students to 121). It has since dropped, possibly because homeless families have moved away or because cases of homelessness haven’t been identified. But school officials say they see the effects of homelessness in classrooms every day. Delavan-Darien isn’t alone. Homeless enrollment has grown statewide nearly every year since the 2003-04 school year. 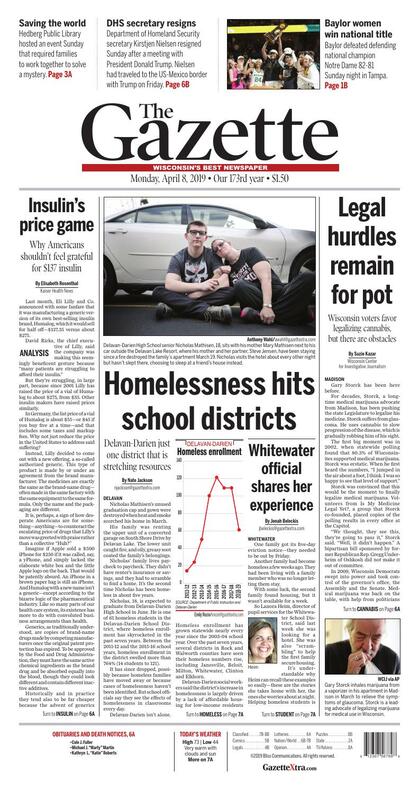 Over the past seven years, several districts in Rock and Walworth counties have seen their homeless numbers rise, including Janesville, Beloit, Milton, Whitewater, Clinton and Elkhorn. Delavan-Darien social workers said the district’s increase in homelessness is largely driven by a lack of affordable housing for low-income residents in Walworth County. “If something happens, some big financial commitment, then that throws off whatever their cycle was to stay financially stable. … They have to pick and choose what they’re able to afford,” said Amy Snodie, a social worker at Delavan-Darien. Access to affordable housing increasingly is an issue in Walworth County. A study last year by the Wisconsin Policy Forum found that 51% of Walworth County renters spend more than 30% of their monthly income on rent. According to the study, Walworth County ranks among the five most rent-burdened counties in Wisconsin, as a result of low incomes and a lack of affordable housing. Delavan-Darien’s homeless enrollment is among the highest in Rock and Walworth counties. In the 2016-17 school year, about 4.9% of the district’s students were homeless. Janesville reported about 5.1% that year, and Beloit reported about 8.5%. By contrast, about 1.8% of Elkhorn’s overall enrollment was homeless in the 2016-17 school year, and Milton reported about 1.2%. Students are considered homeless if they lack a fixed, regular and adequate nighttime residence, according to the federal McKinney-Vento Homeless Assistance Act. Under the law, districts must provide homeless students equal access to free public education. That includes transportation, immediate enrollment, hygiene items, school supplies and free meals, said Lisa McKay, a social worker at Delavan-Darien. McKay said some of the district’s homeless students are classified as unaccompanied youth, meaning they bounce from one residence to the next. Most homeless families are doubled up, meaning they share housing with others. McKay said homeless students face a host of challenges. Some families that become homeless might end up moving to neighboring communities if no affordable housing is available locally. Students then must figure out transportation and how to access resources, McKay said. Snobie said attendance for some students drops when they become homeless. That could be because they no longer live in the district or because they need to care for younger siblings while others search for housing, which can be a grueling, time-consuming process, Snobie said. In an email to The Gazette, a spokesman for the state Department of Public Instruction wrote that the growing number of homeless students across the state appears to be a result of “economic realities” and not a change in reporting methods. He added that homelessness in schools is not specific to urban areas, and like Delavan-Darien, most homeless students statewide are doubling up. According to the state’s data, more than 77% of homeless students across the state in the 2016-17 school year were sharing a residence with others. “We see students experiencing homelessness in every single school district in our state,” he said. Nicholas realized after the fire he didn’t have any deodorant. “It’s such a simple thing to have. It can be taken away so easily,” he said. Nicholas moved to Delavan with his mom, Mary Mathisen, and sister, Kellie, in 2011. Mary found a home in Delavan with a fenced yard for the same price as the two-bedroom apartment they were renting in Chicago. In 2014, the landlord moved to Florida and kicked them out, Mary said. Nicholas was in eighth grade, and the family lived in a car for about two months. They eventually found the home on South Shore Drive and lived there until it caught fire March 19. Since the fire, Mary and her fiancé, Steven Jensen, have been staying in a sunny room in the Delavan Lake Resort with two service dogs. They each make $800 a month from government disability payments. Lake Lawn Resort in Delavan is paying for the room, and McKay is helping the family find housing. A GoFundMe page for the family had raised more than $1,700 by Sunday. Nicholas visits the hotel about every other night, but he hasn’t slept there. He sleeps at a friend’s house. He tries to keep moving and stay busy, he said. “It’s weird to have all of this, and one day you turn around and you don’t,” he said. Nicholas said he feels fortunate in way. Nobody was hurt, and the things that were destroyed can be replaced, he said. After the fire, neighbors and the school district donated clothes and money to Nicholas and Kellie, and a family friend is trying to salvage the old clothes and eliminate the smell of smoke. Nicholas’ math teacher and principal will ask how he is doing, he said, and friends have offered to buy clothes. He said he is stubborn and didn’t want to ask for help. He didn’t want to bother people. Mary said Nicholas’ grades have remained steady since the family was uprooted. He still goes to work in the evenings. He went to prom Saturday night, and he turned 18 on March 30—11 days after the fire. Nicholas said he would have liked to have been home on his birthday. In her hotel room last week, Mary became emotional when talking about the outpouring of support from the community and the school district. She said the district replaced Nicholas’ cap, gown and tassel for free. Nicholas has a two-year scholarship to Gateway Technical College, Mary said, and he wants to attend Milwaukee School of Engineering or UW-Platteville and wants to study engineering. Nicholas’ friends have helped him remain stable, he said, and he has learned that he shouldn’t take things for granted. He said he will be ready to help his friends if they ever are in trouble. “Not everything’s going to be around. … It’s hard to face, but I feel like with the right people, you can take any kind of challenge on. That’s really what matters,” he said. One family got its five-day eviction notice—they needed to be out by Friday. Another family had become homeless a few weeks ago. They had been living with a family member who was no longer letting them stay. With some luck, the second family found housing, but it wasn’t available for a week. So Lanora Heim, director of pupil services for the Whitewater School District, said last week she was looking for a hotel. She was also “scrambling” to help the first family secure housing. It’s understandable why Heim can recall these examples so easily—these are the stories she takes home with her, the ones she worries about at night. Helping homeless students is “just part of our daily routine,” she said. The number of homeless students in Heim’s district last school year was more than double what it was three years ago—going from 31 in 2015-16 to 67 in 2017-18. School districts step in to assist homeless students more than the public realizes, Heim said. In Whitewater, they have fixed cars, negotiated with landlords, paid landlords rent or deposits, arranged for hotel rooms, and more. It’s also about making sure the students get to school. Heim said districts are required to do so, but it is costly in Walworth County, which she said has an “awful” lack of transportation options. And sometimes students need to come in from Beloit, Delavan, Elkhorn or Fort Atkinson. Last year, the district paid for one family of three to be bused in for the year, which cost $15,000. Heim said she wants legislators to pay more attention to the subject. She supports the federal mandate—the McKinney-Vento Act—but even with it, districts can run into funding issues. What about payment for social workers? For emergency funds? For transportation? “It’s an important thing to protect these vulnerable families,” she said. Every school district is required to have a liaison to work with homeless students. Heim and district social worker Mary Geraghty share the responsibilities for Whitewater. When asked how she is doing, Heim laughed. She rarely stops to think about it. Working with teenagers isn’t hard, she said. What is hard is worrying about children who are in unsafe situations. “You can’t do a job like this without feeling a calling to it,” she said. “I sincerely feel like I feel a calling to it. Last month, Eli Lilly and Co. announced with some fanfare that it was manufacturing a generic version of its own best-selling insulin brand, Humalog, which it would sell for half off—$137.35 versus about $275. But they’re struggling, in large part, because since 2001 Lilly has raised the price of a vial of Humalog to about $275, from $35. Other insulin makers have raised prices similarly. In Germany, the list price of a vial of Humalog is about $55—or $45 if you buy five at a time—and that includes some taxes and markup fees. Why not just reduce the price in the United States to address said suffering? Instead, Lilly decided to come out with a new offering, a so-called authorized generic. This type of product is made by or under an agreement from the brand manufacturer. The medicines are exactly the same as the brand-name drug—often made in the same factory with the same equipment to the same formula. Only the name and the packaging are different. Imagine if Apple sold a $500 iPhone for $250 if it was called, say, a yPhone, and simply lacked the elaborate white box and the little Apple logo on the back. That would be patently absurd. An iPhone in a brown paper bag is still an iPhone. And Humalog with a new name isn’t a generic—except according to the bizarre logic of the pharmaceutical industry. Like so many parts of our health care system, its existence has more to do with convoluted business arrangements than health. Generics, as traditionally understood, are copies of brand-name drugs made by competing manufacturers once the original patent protection has expired. To be approved by the Food and Drug Administration, they must have the same active chemical ingredients as the brand drug and be absorbed equally into the blood, though they could look different and contain different inactive additives. Historically and in practice they tend also to be far cheaper because the advent of generics often introduces robust competition into the market. That is why brand manufacturers sometimes produce an authorized generic once they lose patent protection. That way, they can compete at the lower price point while preserving the original for those with extreme label loyalty. More recently, authorized generics like Lilly’s stem largely from a different strategy—based on the perverse ways money flows through our health system and who keeps the cash. Over the past 20 years, drugmakers have continuously raised the price of some essential medicines in the United States because, well, they can in a country that doesn’t set drug prices. And they do—until the bad publicity catches up with them. Mylan got hauled before Congress in 2016 for raising the price of an EpiPen. Now it’s insulin’s turn. The other two major makers of brand-name insulin products—Novo Nordisk and Sanofi—have raised prices in lockstep with Lilly. But they are based in Europe, so the Indiana-based Lilly has been the primary focus of angry protests here. Part of insulin’s price rise in the United States is because of the middlemen who buy the drugs on behalf of insurers and hospitals and negotiate discounts off the list price for their clients. So Lilly often doesn’t make the full $275 a vial (though, because rebates are secret, we don’t know how much less). By selling an authorized generic, rather than merely lowering the brand’s price, Lilly is essentially doing an end run around those middlemen and giving patients who don’t purchase through an insurer another option. It is also making sure that if and when cheaper versions of Humalog emerge, it will have an offering to compete. In fact, a “biosimilar” version of Humalog already exists. It was introduced to the United States last year. And yet it costs around the same price as the brand-name drug. Why? It is made by Sanofi, which has no interest in starting a price war to lower costs. Finally, Lilly has generated a few positive headlines. “Eli Lilly Will Sell Half-Price Version of Humalog, Its Best-Selling Insulin,” The New York Times reported. Mylan effectively calmed its EpiPen PR crisis by introducing a cheaper authorized generic. Now Lilly, following a similar playbook, is hoping for a similar result. Will it work? Politicians and patients will decide. But they might well keep these two thoughts in mind: If the product being sold were electricity or gas for your car, a price rise of more than 600 percent over 15 years would be regarded as price gouging and wouldn’t be tolerated. And in Germany and many other developed countries, there is no need for a $137.35 vial of “authorized generic” for Humalog. At around $50 a vial, Humalog as Humalog costs far less. Gary Storck inhales marijuana from a vaporizer in his apartment in Madison in March to relieve the symptoms of glaucoma. Storck is a leading advocate of legalizing marijuana for medical use in Wisconsin. Gary Storck has been here before. For decades, Storck, a longtime medical marijuana advocate from Madison, has been pushing the state Legislature to legalize his medicine. Storck suffers from glaucoma. He uses cannabis to slow progression of the disease, which is gradually robbing him of his sight. Storck was convinced that this would be the moment to finally legalize medical marijuana. Volunteers from Is My Medicine Legal Yet?, a group that Storck co-founded, placed copies of the polling results in every office at the Capitol. “We thought, they see this, they’re going to pass it,” Storck said. “Well, it didn’t happen.” A bipartisan bill sponsored by former Republican Rep. Gregg Underheim of Oshkosh did not make it out of committee. In 2009, Wisconsin Democrats swept into power and took control of the governor’s office, the Assembly and the Senate. Medical marijuana was back on the table, with help from politicians including Sen. Jon Erpenbach, D-Middleton. Political support seemed to be on the upswing. That year, a public hearing was held. Fifty-five people spoke in favor of the bill; another 49 registered in favor. Five people spoke against it. “It seemed like the stars had aligned for us,” Storck said. But the bill, unable to garner enough bipartisan support, never got a vote. Powerful interests, including the Wisconsin Medical Society and the Wisconsin Department of Justice, were opposed. While Wisconsin’s laws on marijuana have stayed largely the same—and federal law continues to ban use and sales—bordering states have begun to move on the issue. Illinois, Michigan and Minnesota have all legalized medical marijuana, with Michigan also legalizing recreational use in 2018. Overall, the medical use of cannabis is legal in 33 states, along with the District of Columbia and several U.S. territories. Recreational use is legal in 10 of those states plus D.C. A legalization push in New Jersey, which is controlled by Democrats, recently failed after lawmakers could not reach consensus. Milwaukee County District Attorney John Chisholm believes legalization is imminent. “The reason I say it’s coming is that pretty much across the state, law enforcement has de-emphasized marijuana enforcement, particularly for possession,” said Chisholm, a Democrat. He noted that in many areas, police officers prefer to give tickets rather than arrest those caught for possession of small amounts of marijuana. Gov. Tony Evers has announced proposals to legalize medical marijuana in Wisconsin, decriminalize possession of small amounts of the drug, allow expungement for possession charges, and update state laws governing cannabidiol, or CBD, a non-intoxicating over-the-counter treatment for anxiety, seizures and inflammation. Evers also has said he would consider legalization of recreational use if voters approved it in a statewide referendum. Evers’ proposals have been lauded by Democratic state legislators—and even some top law enforcement officials—who have seen support for legalization grow in Wisconsin in recent years. In January, a Marquette Law School Poll found that 58% of Wisconsinites believe marijuana should be legalized and regulated like alcohol, with 36% opposed. In November, local advisory-only referendums in support of marijuana legalization were passed in large numbers across the state, including 16 counties and two cities. Whether the question was about medical or recreational marijuana, no measure passed with less than 60% support, and no measure was rejected. Evers’ plan has also been endorsed by other Wisconsin top law enforcement officials, including Chisholm, who believes that the proposal could help to reduce disparities in how marijuana possession is treated around the state. Assembly Speaker Robin Vos, R-Rochester, opposes most of Evers’ plan. The governor’s proposal “makes it easier to get recreational marijuana and provides a pathway to full legalization, which I do not support. I’m open to medical marijuana when it’s prescribed by a doctor, but it has to be done in a targeted way without allowing recreational use,” Vos said in a statement. In an email, an aide to Senate Majority Leader Scott Fitzgerald, R-Juneau, reiterated his previous positions in opposition of legalization. And there are groups, including Smart Approaches to Marijuana, that would likely mobilize if Wisconsin proposes legalizing the drug for recreational use.